For this the last battle can’t be won. Only stay with me to the end. Who has to decide the thing to do. 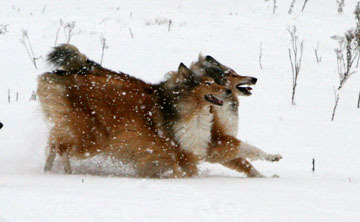 Reproduced from the 1990 International Collie Society Handbook (p79). We were increasingly aware of Tess slowing down through February and March. She still had a good appetite, had the usual bursts of energy, and played with Cara, but gradually spent more time on her own. She was content to watch the birds in the garden and have a quiet life. As March turned into April and the weather became warmer we were hoping she would pick up a bit. A visit to the vet could reveal nothing specific, so a blood test was performed to make sure that everything was ok. The results were normal. One day in early April she had a high temperature, and was very unsteady on her feet. Suspecting an infection( of undetermined origin) the vet gave her a course of anti-biotics. The temperature came down and she seemed to perk up a bit, but she was never to be the same. A few weeks later in May, she became very unsteady on her back legs and disoriented and went into the local veterinary hospital. Again blood tests revealed nothing. A working diagnosis of blood toxicity became unsupported and we brought her home to be with us and familiar surroundings. It became too much to bear to see her go down hill and be so distressed. Looking into her eyes created an unexplainable yet clear impression that she had endured enough. It was as though she wanted to say that she did not want to be like this anymore and it was time to draw the line. The decision was made that the only humane thing to do would be to let her rest in peace. The irreversible decision was taken and the injection administered just after midnight on Wednesday 21st May 2014. Tess was brought home. Although we had decided to have her cremated, we wanted to bring her home and arrange this ourselves. We did not want to leave her at the vets. Firstly because we had read somewhere that it is important to let the other dogs in the family see her. 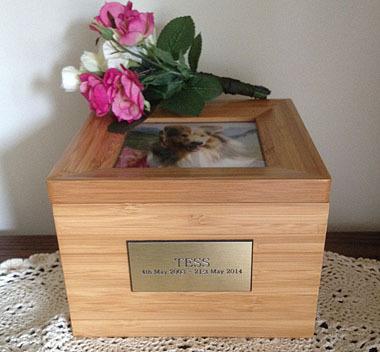 Secondly, we wanted to be sure it was Tess’s ashes that were returned to us. Finally, to say goodbye properly it was important that she was treated with dignity. Watching the other dogs take turns to approach Tess’s body was a strange experience. Holly went first, circled, sniffed and walked quietly away. It was as if she knew. Connor and Kerry stayed away until Holly had finished, and then approached, sniffed, and then withdrew. Finally, Cara did likewise. May she rest in peace until we are united with her again. 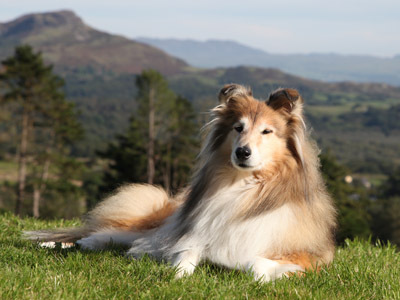 On her last holiday, relaxing on a grassy bank on a sunny afternoon in north Wales, happy and contented. This is how we would like to remember her growing old with dignity with her family around her. Below: Tess used to love being out in the snow! Give her an open space and she would be racing shoulder to shoulder (and just in the lead)with Holly. 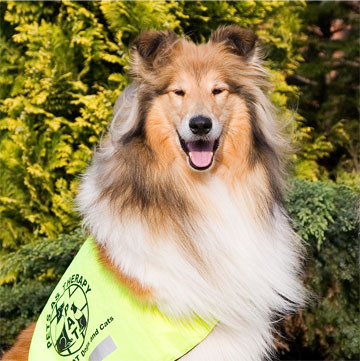 Tess was a registered Pets As Therapy dog and touched many hearts when she visited the local care home. 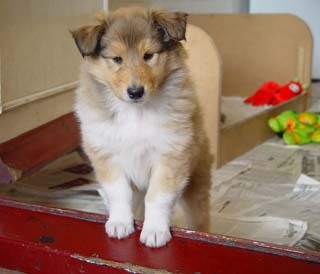 Tess at just 7 weeks old, one our earliest photos of her at the Ladnar kennel where she was born.